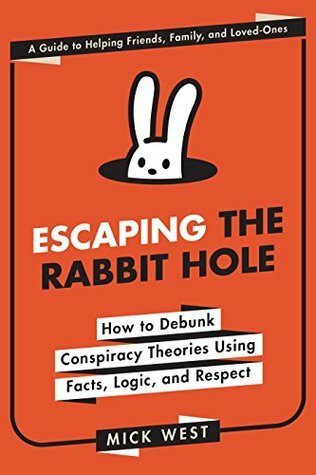 Escaping the Rabbit Hole: How to Debunk Conspiracy Theories Using Facts, Logic, and Respect. By Mick West. Skyhorse Publishing. 2018. 304 pp. Hardcover, $21.99; kindle, $13.19. Mick West might just be the consummate gentleman debunker. After devoting the past fifteen years to online conspiracy-fighting projects such as MorgellonsWatch.com, ContrailScience.com, and Metabunk.org, he has released a new book. It’s easy to see conspiracy theorists as unreachable, unreasonable, and unredeemable. But West is here to help, and he offers this help on multiple levels. It can be self-help if the friend caught up in a rabbit hole is you; it can be help for loved ones, even if they act like enemies when certain topics come up; and it can be help for society at large. The harm these false beliefs cause is not limited to particular relationships or households—it spills into public discourse and legislation. West sees the term debunking as noncontroversial in this instance, because when he shows people the error of chemtrails or flat-earth theory, he is not remaining impartial to investigate an unknown but rather introducing people to facts that have already been proven. The bunk has already been established as bunk; it’s now an issue of debunking the mindset. A former game programmer, West admits it’s a process comparable to debugging. Readers seeking a trove of empirical data might be disappointed, as Escaping the Rabbit Hole is not packed with charts and graphs—with a few exceptions, such as a graph illustrating the usage of the term conspiracy theory, to debunk the idea that the CIA promoted the term conspiracy theory as a pejorative in a 1967 memo (… talk about meta bunk). West offers a tour of some of the academic thinking on conspiracy theorists, but he cautions that the psychology of conspiracists is not well understood. The few traits they are said to share are often overstated and understudied. The sixteen pages of endnotes are mostly links to online articles, conspiracy videos, and threads. Part two comprises in-depth looks at four particular types of conspiracy theories (chemtrails, 9/11 demolitions, false flags, and flat earth) as well as stories from people once taken in by those theories. Throughout the discussions, West provides resources and sensible approaches to dealing with these conspiracy theories, ones he is particularly experienced with, thanks to Metabunk. Being a capable debunker means becoming familiar with the conspiracies, and West saves us time by summarizing what believers subscribe to (including variations, as no group is completely homogenous). Indeed, the fact that each believer is unique means that different approaches are needed. In part three, his final two chapters discuss complications and the future of debunking. Turning someone away from a seductive, simplified view based on scientific misunderstanding will never be easy. It requires scientific communication on a very personal level, doing research, and gaining an understanding of fields that you might be unfamiliar with—and, even if you do the work, your friend might not be able to understand it. Or, if you succeed communicating the ideas, accepting a new version of reality might be complicated by family dynamics or personal conflict. We also have Russian trolls, bots, AI, and other technological surprises that will make debunking even harder. Debunking conspiracy theories is a lot of work. But it’s worthwhile if you are helping a loved one out of a mindset that can cause them harm. Mick West has shouldered a tremendous amount of the work himself, summarizing some conspiracy beliefs and demonstrable facts to refute those beliefs in this relatively short book (278 pages, plus a useful index). He offers both psychological and practical shortcuts—in one instance he directs us to a video of old books he’s collected to debunk chemtrail theory. This simple video showing old-fashioned books has persuaded many who had rejected similar online images as fake. One hope that comes through in the personal stories is the notion of turning conspiracy theorists into conspiracy debunkers. Many conspiracists are already prone to asking questions; they just need guidance on how to vet information. West describes his own transition as a youth, swapping information via bulletin boards, and how his fascination with strange phenomena shifted from reading about the unexplained to, instead, finding explanations and sharing those with his friends. Other people he quotes made similar transitions, if a bit later in life, and describe how they enjoy keeping up with conspiracy theories nowadays simply so they can interject new knowledge back into their old communities. With persistence—and of course facts, logic, and respect—we might just pull something unexpected out of a few rabbit holes: skeptics.